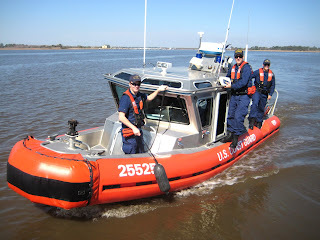 "aCappella, this is the United States Coast Guard. When was the last time you were boarded?" It was five years ago. A year or less and they typically give you a pass. But we don't mind getting boarded. 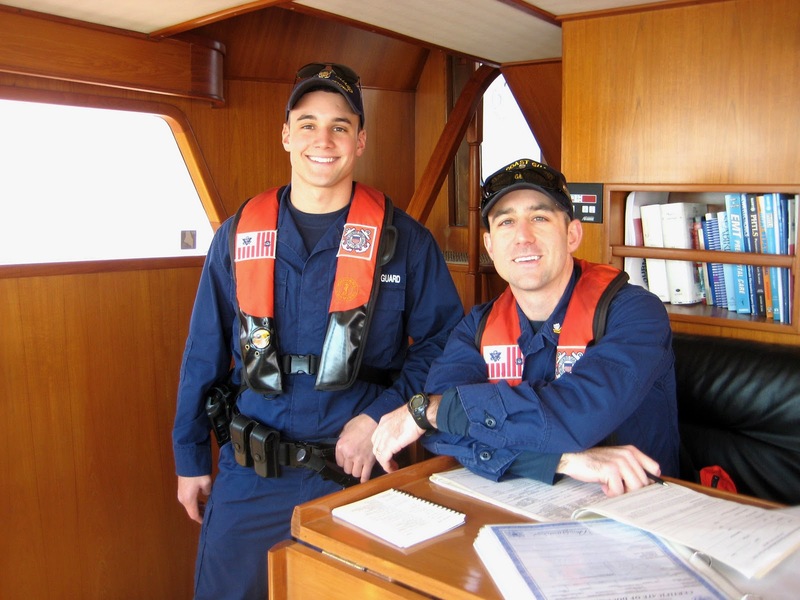 It's an important function and we have always found the Coast Guard officers to be polite and friendly. So we slowed a bit, opened the transom door, and warned them that we had two dogs onboard. Or as we like to refer to them, the killer security team. The kids knew something was up and were on high alert. Within minutes Luke and Nick were onboard. What!?!? 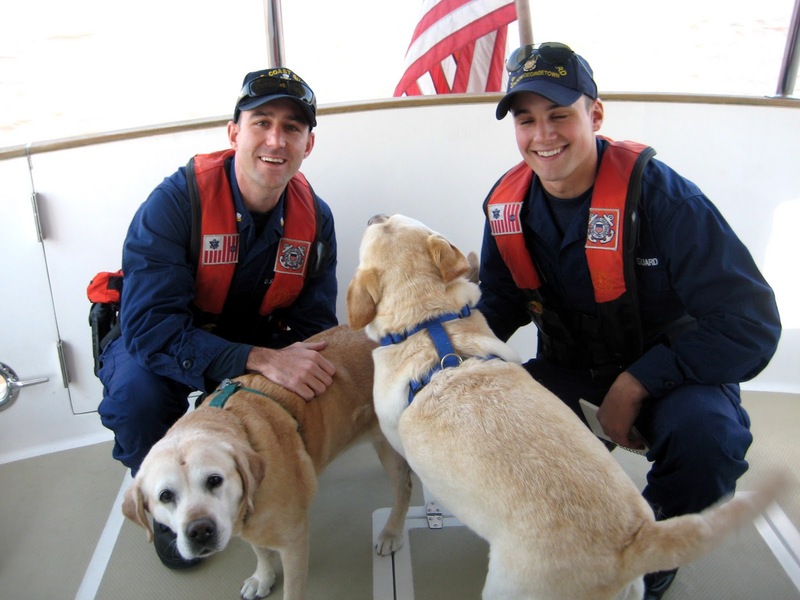 Dyna and Dylan had no idea we could have visitors while underway! I mean, they meet all kinds of people at the dock and on land. 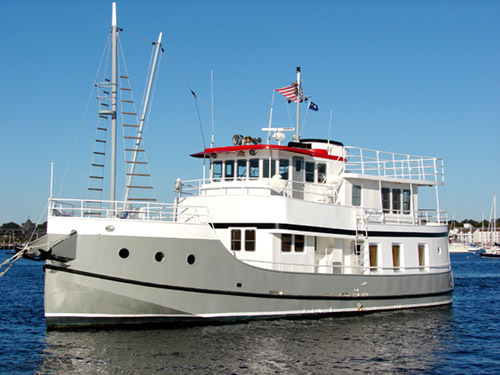 Folks have come onboard at marinas and even when we're at anchor. But while underway - no way! Luke and Nick were great even while D and D gave them the standard Lab greeting, covering their navy uniforms with short blond hairs. Hopefully neither one has a jealous wife or girlfriend. We passed our inspection with flying colors. But couldn't convince them to give us extra credit for having life vests for the dogs as well as for us. They posed with the kids for a farewell picture. They looked great but Dylan was still in greeting mode and couldn't sit still. In a moment they were gone. We received the much prized "gold document." So next time we hear, "aCappella, this is the United States Coast Guard. When was the last time you were boarded?" we might get skipped by providing the gold serial number. Or maybe not. Dyna and Dylan thought it was pretty cool to have visitors while underway. 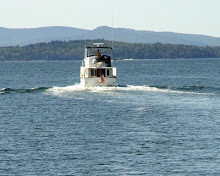 One of the things we like about the boat is that we walk - alot. 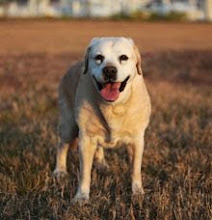 We both enjoy walking and like the exercise it gives us. We've walked miles to restaurants, shopping, for propane refills, dog parks, you name it. We're both in need of haircuts and just found a salon that's "only 2 miles away." One of the things we have at times lamented and at times found humorous is how the rest of the world reacts to people walking. It's just not too common nowadays. We've finally figured out never to trust someone telling us, "Oh, it's just up the road. Real close. 5 minutes maybe." Which would have been true - if we had a car. We thrill at finding a decent sidewalk, especially if it doesn't abruptly end for no apparent reason. We've had cars stop and ask if we broke down and need a ride. People walking are considered a strange sight. One thing I'm liking about being here at Grande Dunes is that there is a great Loews grocery store just up a hill and across the street. Every 2-3 days I've set out to bring back fresh fruits and veggies, ice cream which we can eat relatively guilt free due to walking, fresh meat for the grill, and whatever other treats we feel like. And it even has a Redbox for movies. I have a one of those foldup rolling crates to bring the loot back. We actually have two for bigger trips when we both go. I enjoy the break and the walk. So today I set off with a short list of fresh items to feed us for the next few days. As I got to the check out I lifted my folding cart out of the shopping cart and began opening it up. The young woman who was bagging commented, "Oh neat, you brought your own cart." "Yes, it's really convenient," I said. "Yeah, you can just wheel it out to your car." 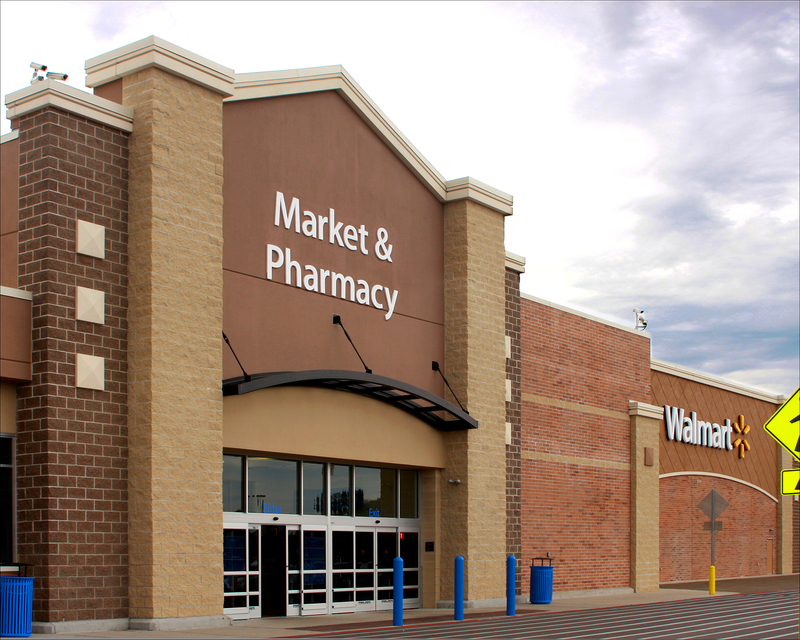 "Hey, (name of cashier), she's walking!" "You're walking!?!" he said. "How far do you have to walk?" she said. "Yes, I'm on my boat in the marina across the street." "That must take you 15 minutes to walk that," he said. "No, only about 5," I said. "Wow, you do that in only 5? Hey, (name of supervisor walking past), she's walking." "Wow, good for you," she said. I finished paying and the cashier thanked me and beamed, "You have a great walk!" I have to admit I walked out of the store feeling a bit like a super hero. I imagined that the rest of the work day they were abuzz about that amazing women who bought groceries and then walked. "Yes, I saw her. She just walked through the parking lot and across the street. Amazing!" 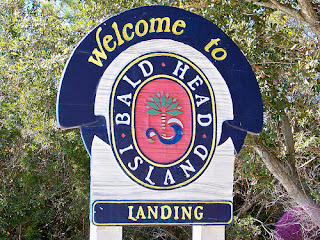 We promised a week ago to relate our experience at Bald Head Island. 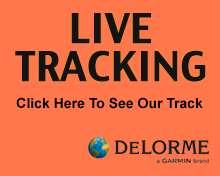 The ActiveCaptain website has had unprecidented traffic and use this month. We've also been working on rolling out new promotional programs, so it's been too busy and hectic. Sorry to take so long. 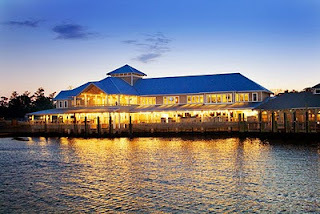 Bald Head Island has become a special place to us. 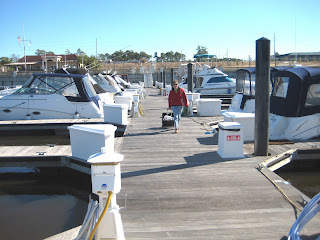 We stayed longer at Bald Head Island Marina then we have ever stayed at any other marina - even with the two weeks we spent off the boat. The island is something not to be missed. 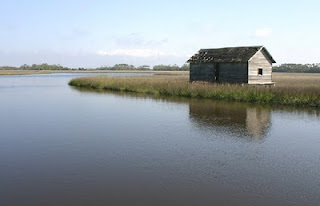 Whether you come by boat, rent a house for a vacation, or visit for the day by ferry, it is a place of great natural beauty with a community committed to preservation. Miles of beaches, acres of maritime forests, huge wetlands with streams to kayak through, and quiet paths to walk or bike without the roar of cars. Needless to say it will be quite some time before the kids find a place they like better. How do you beat a romp on the beach every day at low tide? Add to that the various accumulated smelly things that the ocean washes up and you are describing dog heaven. But Dyna and Dylan's people enjoyed the experience also. We rode our bikes somewhere most every day, saw scores of birds and other wildlife, and also enjoyed our daily walks on the beach. 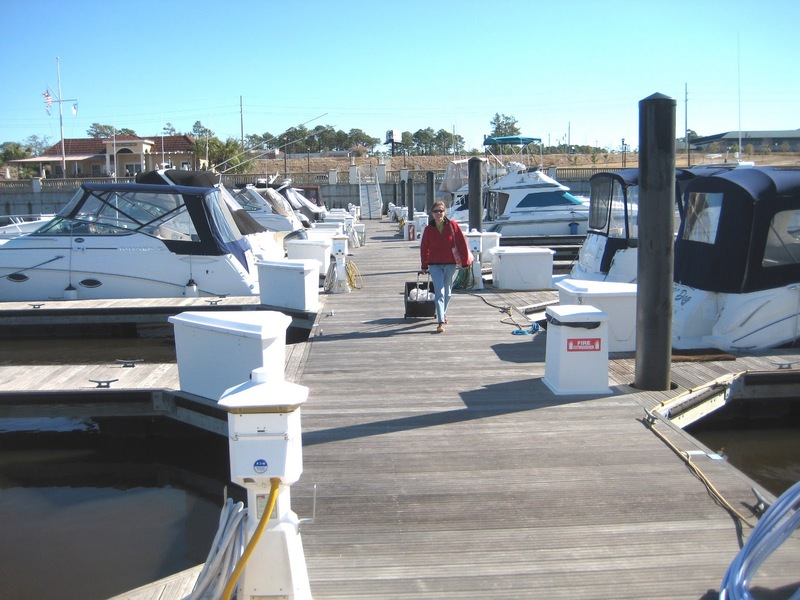 The marina is well maintained and the staff is friendly and helpful. There is a wonderful market a short bike ride away along with an amazingly stocked hardware store. We made that trip every couple of days. There is a bar and restaurant right at the marina and two nicer clubs across the island. 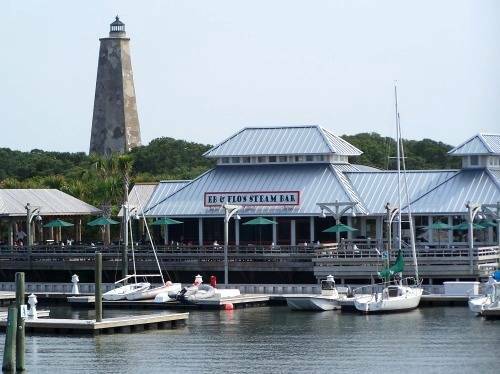 We were fortunate to meet Suzanne Dorsey, Director of the Bald Head Island Conservancy who filled us in on the islands unusual history and took us to some great out of the way places. In season they offer a wide variety of programs. 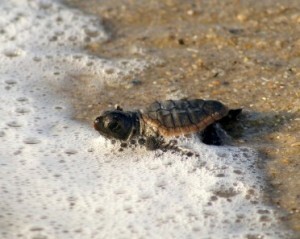 And we are already plotting to figure out how we can convince our insurance company to let us south early to see the hatching of the baby turtles. 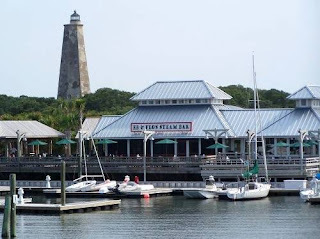 We think that Bald Head Island is so close to being the perfect boating stop that we began nagging (well, we called it advising) them on how to make it even better for boaters. Either they are extremely polite or they really are interested in making Bald Head Island one of those places every boater stops at for a few days when heading south or north.